"Y'all are just over the top, Pastor Troy," Donna Tidwell said in reaction to the house constructed at a cost of $85,000, according to the Star-Telegram. 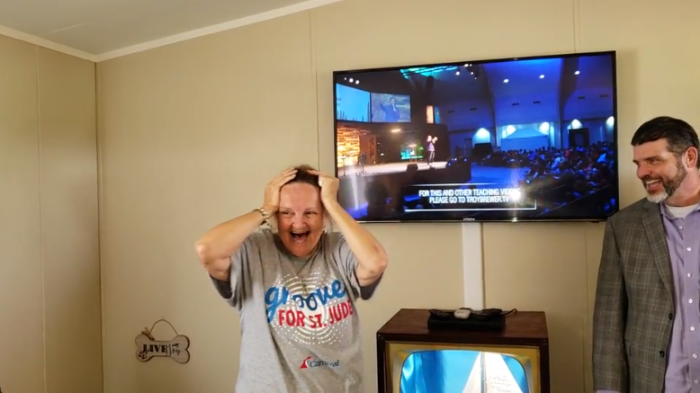 For the first five minutes of seeing her new home provided by Open Door Church in Burleson, Texas, and their senior pastor, Troy Brewer, two Sundays ago, all Tidwell was able to do was smile and say "Oh my gosh," The Star-Telegram said. "The roof was falling in, the house was in terrible repair," Brewer said. "Honestly, I cried when I left there. I thought we can do better than this." Brewer told the Star-Telegram that he initially tried to repair Tidwell's old double-wide mobile home but that plan was quickly dismissed by a construction expert. "I asked a builder to go over there and take a look at her house to talk about repairing it and he came back and said it's not worth fixing," Brewer said. "There were parts of the roof where you could see outside. I told my executive pastor we had to get her a new house." Jerry Sellers, the church's executive pastor, said approximately two-thirds of the church's 5,000 members know Tidwell and they all appear to love her, according to the Star-Telegram. "She never asks anyone for anything," Sellers said. "No matter how bad things get, she never says anything. She just smiles. She has the joy of the Lord within her. When we made the announcement, everyone in church stood up and gave her a standing ovation." "I was in shock. I almost had a panic attack," she said after seeing her new three-bedroom manufactured home. "I know it sounds hard to believe, but it's true. They even gave me a new mailbox." "The cruise was so much fun. We hung out on the beach, which was great. I got a massage on the beach. I wasn't expecting any of this when I got back. This is amazing. It's my church family and I don't know where I'd be without them."